Pit dates.You don’t have to chop them. I do not have a food processor, but you could use one for this. I used my stand up mixer with the flat beater and it works fine. 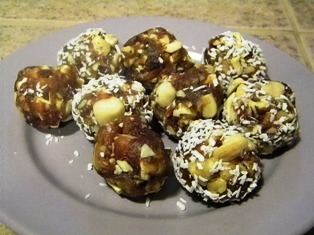 Place the dates and nuts into the bowl and beat at medium speed (start slow and then turn it up) until it is well mixed. Most of it will work up into the beater, so you will have to stop it scrape it back into the bowl to continue mixing. Mix until it forms a large ball. Break off into smaller pieces and form into a one inch ball. If desired roll ball in shredded coconut. I like to store these in the freezer or the refrigerator because I like them to stay firm.